Lucy obtained her BSc (Hons) in Osteopathic Medicine in 2004 after studying the four-year full time degree at the British College of Osteopathic Medicine part of Westminster University. Lucy is a fully registered member of the General Osteopathic Council , which is the official organisation which accredits practitioners for competence and safety. Lucy conforms to Best Practice guidelines and standards which requires continual professional development, insurance, along with liaising with local GP practices. Lucy is also a member of The Institute of Osteopathy. Having undertaken numerous postgraduate courses including Pregnancy, Obstetrics, Osteopathy in the Cranial Field, Sports Injuries and Taping courses, Lucy treats a wide variety of musculo-skeletal ailments. 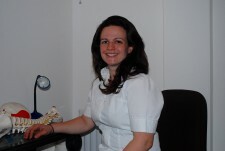 and being a new mum herself, she has a particular interest in mother & baby (cranial) osteopathy. Lucy has always been a keen sportswoman, and has had great success in treating and rehabilitating an extensive range of sports injuries and rehabilitating them. Please see the treatment page for the full range of conditions that can be treated. To book an appointment please contact us. Should you wish to discuss any questions you may have regarding osteopathy and the treatments available, please call Lucy at the clinic 0208 892 2356 to find out further information on how she may be able to help.